This weekend, I saw producer Steven Spielberg’s latest #1 blockbuster Eagle Eye. In a particularly exciting scene, the cameras flashed to the front of a some impressive looking information processing equipment. When they needed equipment to represent the super-computer named ARIA, they used EMC’s DMX arrays. The “Direct Matrix” Symmetrix storage systems are indeed the most powerful platforms one would think of, and an outstanding visual selection for the movie as well. 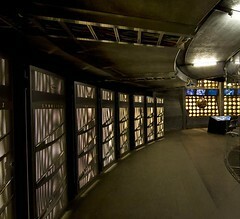 As you can see along the left wall in the picture, they have a next generation look that fits in well with the sophistication of the set used to represent the super-computer complex. The Internet Archive contains almost 2 petabytes of data. The movie production company got 30 DMX arrays which were lifted by crane into the massive set, situated inside large airplane hangers that once housed Howard Hughes’ airplane The Spruce Goose in Playa Vista, Southern California. You can see all the photos on Flickr here. Eagle Eye is a dramatic techno-thriller that opened in late September as a standard film as well as an IMAX movie. And, as the subject of the movie is concerned with mobile devices, there is a mobile version of the Eagle Eye: the Mobile Game available on a variety of BlackBerry, Windows Mobile, and Java powered devices. Even Steven Spielberg recognises us…. Every man dies but not everyman truly lives ~ Braveheart!